• Repair and replacing automotive interiors. We specialize in the replacing and/or repairing of all foreign and domestic automotive interior and exterior upholstery. Our jobs range from simple re-stitching of a seam in a torn seat to re-upholstering an entire car including carpet, headliner, dash, door panels, seats, trim pieces, exterior vinyl tops and much more. Each job includes disassembling the damaged upholstery, repairing or replacing and reinstalling of the new upholstery. As every car is different and as each manufacturer changes the design and specifics of the upholstery in a vehicle almost annually it is important that we are up to date on all new and old automotive interiors and exteriors. •	Replacing of convertible tops. 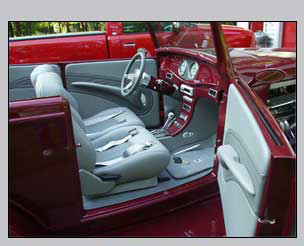 We have experience in the removal, remaking and installation of convertible tops from the early 1900s to present day. This is a trade in its own right. In order to work on convertible tops, the installer must have knowledge of the mechanics of the motor, frame and the correct installation of the vinyl or cloth top including the vinyl or glass window. In some cases, there are no existing original or after market tops to fit a specific car so we make the top from scratch without an existing pattern to the original frame. •	Sell and install after market accessories and kits. Dave's Upholstery sells and installs after-market products, accessories and car kits. Some of the products presently offered are tonneau covers for the back of pickup trucks, seat heaters, gel pad inserts, seat covers, door panels and many other items. We are the local distributor for many nationally recognized companies such as Katzkin Leather, Corvette America, Ground Up, Robbins Tops, and many more. These companies are great for customizing your car to your own personality or restoring an original Chevelle, Corvette, Mustang or any muscle car to it's original glory. Have a look at Dave's Performance & Accessory website for all our aftermarket products and accessories to customize your vehicle.